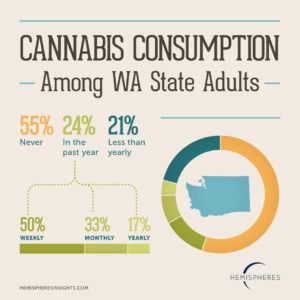 Cannabis is becoming mainstream with a quarter (24%) of Washington State adults (21 and over) consuming cannabis in the past year and 12% on a weekly basis. 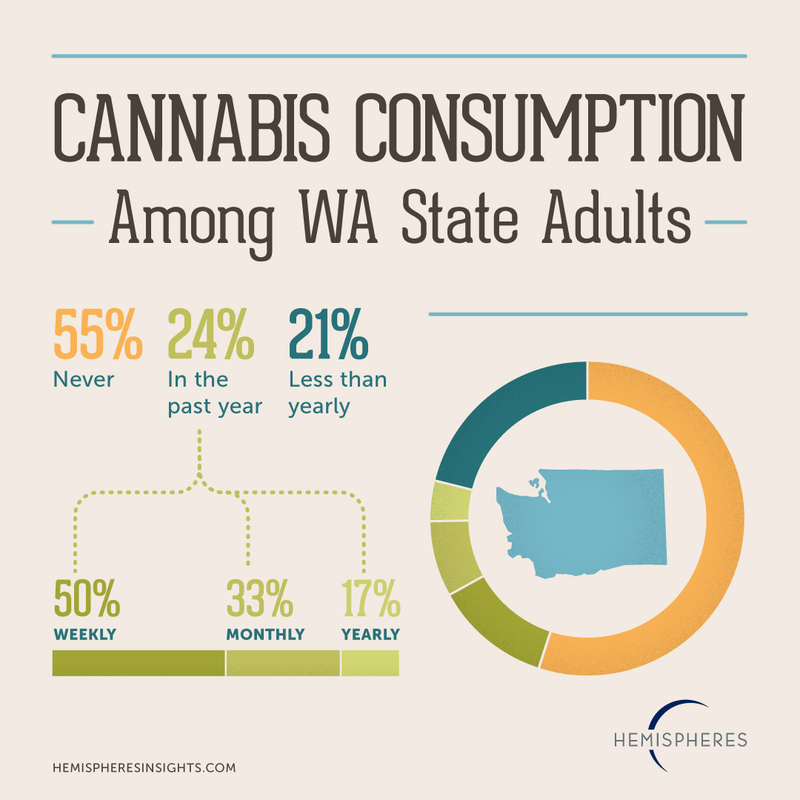 These consumers of cannabis in most cases are representative of the population of Washington State regardless of demographics or region. 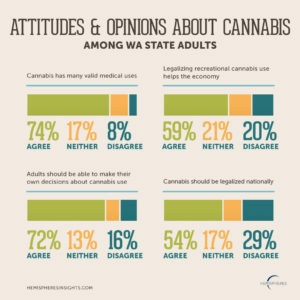 Recreational cannabis stores have been visited by 21% of Washington State adults. Consumers of cannabis have more evolved views about what they are looking for in cannabis products and retail services. They describe their ideal store or packaged product as being “natural,” “modern,” and “authentic” rather than “psychedelic,” “edgy,” or “exotic.” There is also a move to the consumption of newer forms of cannabis including food products, oils, lotions, and beverages. More than a third (37%) of those who have used cannabis in the past year say that their use has increased since legalization. 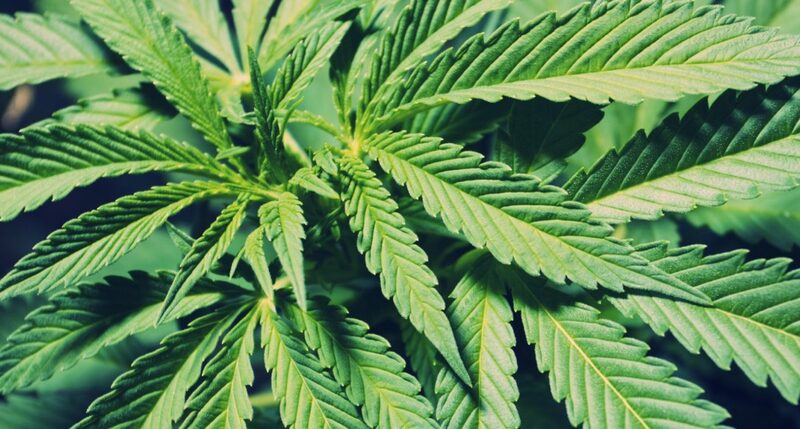 Non-users and past-users of cannabis have been much less effected by legalization. Of those who used cannabis more than a year ago, only 14% are likely to try it in the next year. This rate drops to 1% among those who have never tried cannabis. 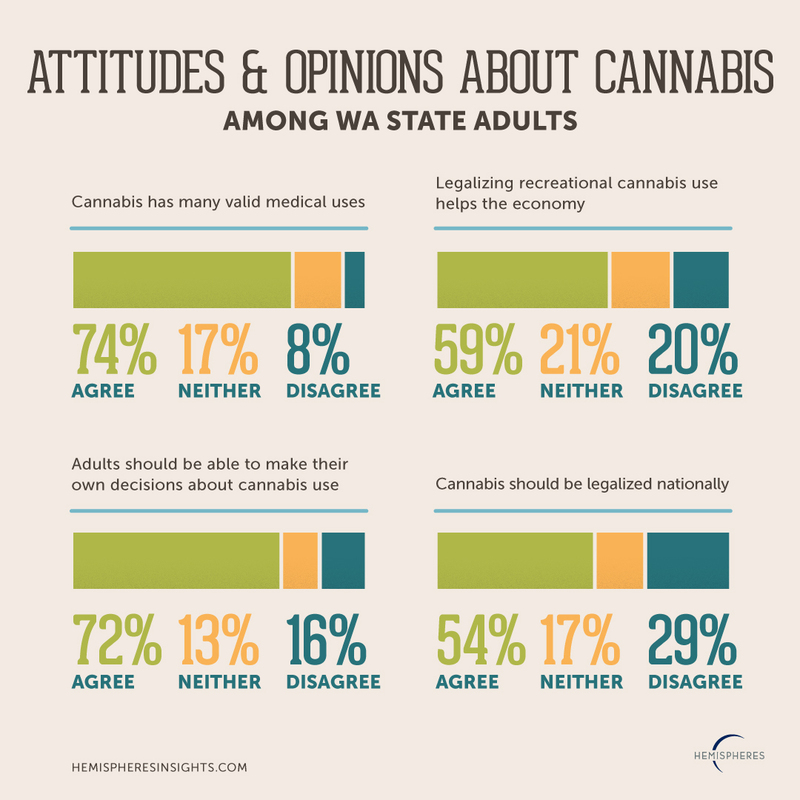 This survey included 1000 Washington State adults (ages 21+) representative of the state’s population. It was conducted in November 2015 by Hemispheres: a customer insights agency offering a full range of marketing research and strategic consulting services. Their goal is to give companies the insight to truly understand customers as well-rounded human beings, resulting in a better ability to create products and services that inspire and delight. Hemispheres is based on Ballard Avenue in Seattle. The full report is available upon request.